Federal entitlement programs are decimating the lives of children and trampling on the rights of fathers to the care and companionship of their kids. We must dismantle the Federal-State entitlement nexus that deprives men of their civil liberties. Here is what every man in America should know. Congress would feign admit its own dubious contribution to the suffering of America’s children. Rather, these politicians promulgate the myth that they are helping children through federal and state welfare entitlement programs. It is, in fact, these very programs which are responsible for the out of control rampage against children. Here is how the scam works. The federal government levies taxes against citizens to redistribute as welfare entitlements among needy applicants. Congress created the Social Security Act, a section of which is called Title IV. Title IV describes how tax dollars will be distributed among the States to subsidize their individual welfare programs. In order for States to tap into the federal treasure chest, containing billions of dollars, they must demonstrate that they are complying with Title IV mandates to collect child support revenues. In other words, to get money from the federal government, each State must become a child support collection and reporting agency. Every unwed or single mother seeking welfare assistance must disclose on her application the identities of the fathers of her children and how much child support the fathers have been ordered by a family court to pay. She must also commit to continuously reporting the father’s payments so that the State can count the money as “collected” to the federal government’s Office of Child Support Enforcement. As with all bureaucracies, this process has developed into a monstrosity that chews up and spits out the very people it was designed to help. States have huge financial incentives to increase the amount of child support it can report to the federal government as “collected”. To increase collection efforts, States engage in the immoral practice of dividing children from their fathers in family courts. Have you ever wondered why family courts award custody to mothers in 80%-90% of all custody cases, even when the father is determined to be just as suitable a parent? It is because the amount of child support ordered by the State is largely determined by how much time the child spends with each parent. This means that the State “collects” less child support if parents share equal custody. By prohibiting fathers from having equal custody and time with their children, the State’s child support coffers are increased and federal dollars are received. Opponents try to paint loving fathers as “deadbeat dads” for daring to challenge the mother-take-all system of family law. This is nothing more than diversionary propaganda. The concern of fathers is not that they are unwilling to support their children financially. This is not an argument against paying child support. Any father that cares about his child will do everything in his power to provide for the child. The concern is, rather, that children are being separated from their fathers by family courts because the State stands to reap huge financial rewards as a result of the father’s loss of custody. The higher the order of child support, the more money the State can collect – even if the amount ordered by the court far exceeds the reasonable needs of the child or if the father is required to take second and third jobs to keep up with outrageous support orders and escape certain incarceration. The truth is that most fathers don’t care about the financial aspects of these family court verdicts nearly as much as they care about having their time with their children eliminated for nefarious government purposes. The root of this evil is a State-level addiction to federal tax dollars being doled out as entitlement monies by a monolithic federal government. In the wake of this horror are millions of children drowning for lack of the care, guidance, and companionship of their fathers. Statistics and empirical evidence universally confirm that children forcibly separated from their fathers by family courts are considerably more likely to suffer anxiety and depression, develop drug addiction, engage in risky sexual activity, break the law, and commit suicide. This travesty must end. Unconstitutional federal bureaucracy creates many of the societal ills it claims to be trying to solve. There are several steps incremental steps that could be taken to restore a child’s right to the companionship of both parents. For example, citizens should insist that States abide by the 14th Amendment to the Constitution. No father should be automatically deprived of his fundamental right to the custody of his children without due process of law. Being a male is not a crime. Absent a finding of true danger from a parent, family courts should order shared parenting rights and equal time sharing for divorcing parents. These rights are fundamental and should not be abridged. The automatic presumption of custody-to-the-mother is unconstitutional. The history of America is brim with examples of the federal government denying basic rights to its citizens. Women were denied the right to vote until the women’s suffrage movement secured the 19th Amendment to the Constitution. Black Americans also were denied the right to vote and suffered myriad other cruel and humiliating indignities under the law until the civil rights movement brought about desegregation, put an end to Jim Crow legislation and compelled the enactment of the 15th and 24th Amendments to the Constitution. In each of these examples, society was slow to recognize that a problem even existed or that some of our laws were unjust. It took considerable time, concerted effort, self-sacrifice and perhaps even divine providence to realign concurrent societal paradigms with the principles of liberty and justice for all. Our generation is not exempt from similar assaults on liberty. While many just causes may stake claims for redress of grievances, one group, more than any other, pleads for immediate support. The need to defend the rights of this group of American citizens, reeling from the unjust consequences of state-sponsored oppression, is before us. It is time to stand up for the rights of children and demand their equal access to both parents. 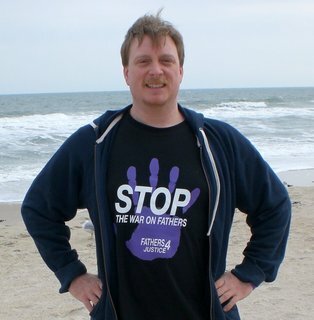 Jake Morphonios is a civil rights advocate and North Carolina State Coordinator for Fathers 4 Justice – US. The political opinions of Mr. Morphonios do not represent those of Fathers 4 Justice. Neither Mr. Morphonios nor F4J-US provide legal advice or assistance with individual cases. PLEASE THUMB THIS ARTICLE to help spread the word to others about this imporant issue. The Federal Scheme to Destroy Father-Child Relationships. I (Bruce Sterling Stelma, M.Ed.) have been and forever will be diagnosed with having Bipolar Effective Disorder. My life changed forever beginning in the fall of 2007: I was 39 years old. I receive SSI due to having bipolar…Even though I’m permanently disabled with having an impediment known as Bipolar Effective Disorder. I am still a productive member of society and I deserve the same rights given to all Americans. Unfortunately my rights are continually being disregarded as my disability has, is and forever will be used against me (ref: FL 08-0295). Bipolar is a disability that is recognized and protected according to the American Disability Act. Bipolar is both a Mental Disorder and a Physiological Disorder. The most common symptom is the mania associated with being bipolar . Bipolar is often different from one individual to the next. Unfortunately most of the psychological professions are still confused. There remains a tendency in diagnosing bipolar with another disability. There are numerous studies which show conclusive proof (validity) through empirical research. These studies have shown and continue to find that there are distinct differentiations: Those that have bipolar their brain activity, synaptic responses and serotonin levels are considerably different from those that do not have bipolar. Therefore the conclusion that Bipolar is in fact is a physiological manifestation which affects the mental processes of the brain: Hence a disability unto itself. Regardless the findings’ it appears that society as a whole, specifically governmental, is reluctant, often ignores, and for the most part refuse to recognize the ramifications of how a disability such as bipolar effects and changes lives of those who have bipolar. Once bipolar appears, it becomes a life long illness (disability). There are those born with bipolar and/or bipolar tendencies and there are those that it takes years in which bipolar shows up. Those that are unaware of having bipolar are unfortunate. The bipolar episode appears in a manic stage and the majority of those inflicted with this horrible condition end up being abandon by those that they love and/or society. They are left to fend for themselves without hope. I the fall of 2007 my life changed forever; I went into a full fledged manic state (Bipolar Episode) when I was 39 years old. The stresses during that time were profound: I was working through the California Department of Corrections and Rehabilitation, Department of Juvenile Justice (CDCR DJJ) @ El Paso de Robles Youth Authority; I was completing a graduate program online through Jones International University; my personal life was in upheaval. At that time married to Karen Lucille Mullis (Stelma). Karen and I had been together since 1988 (19 years). We dating exclusively for seven years, we were engaged for two years and then we were married for 10 years at that point. The one thing that kept and continues to be an inspiration of hope is our son Gregory Sterling Stelma. Gregory was a planned birth and he was born on March 22, 2006. Gregory and I have this uncanny connection that only a parent can fully understand as there is an unspoken communication. I prided myself for being Gregory’s father. Gregory is my shining glory, pride and love. I spent any and all of my spare time with Karen and Gregory as we went everywhere together. When we took Gregory anywhere I carried him in a Bajorn strapped to my chest with Gregory facing forward so he could see the world and the world could see him. Fatherly pride; look at my beautiful boy. Background before the bipolar. Prior and during the fall of 2007 Karen was and became more paranoid. For around a year prior to Fall 2007 Karen refused to go outside until I arrived home from work. She was completely fearful of everyone and everything. For several years Karen consistently told me how much she wanted to move away and how much she hated her parents. She was convinced that her family was out to get her. She had felt this way toward my family since 1988. So of course, Karen and I decided to move. We found a piece of property (40 Acers) up in northern California. I was going to transfer my job. Unfortunately what started out as a well-plained decision went completely out of control. Karen and I went overboard and in the end the bankruptcy was around $225k. This is a bipolar tendency of losing control of money and financial decisions make no logical sense. I never bought anything without Karen’s approval. She was buying items with my assistance and I would buy things with her assistance. Yet in the end Karen convinced everyone that she never contributed to putting us in bankruptcy. We had saved money for our future. I had been receiving student loans which we saved. We had saved around $ 30k-40k and hid that money in a safe. We also had $10k in our banking accounts. Plus Karen had at least 30k in jewelry that I given to her over that 20 year period. I was left nothing as even all my art was taken and probably thrown away. We were only paying $700.00 a month for rent. Karen was receiving benefits through social services as well prior; Karen handled all the financial decisions and paperwork. This money was still in safe and in the bank as far as I know as we did not spend that at all; which was not part of the bankruptcy to that of my knowledge unless Karen spent and/or hid these monies. We had apartment insurance as well for $25k-30k. Everything was taken by Karen and I was only left with a few of my personal items. Karen has been claiming that we had nothing and that we were poor: thereby received and may still be receiving assistance through her lying about assets. Do to Karen’s growing paranoia I decided to stop going to work as Karen would cry, plead and insist that she was alone and that I was abandoning her. Karen was completely convinced that no one liked her at all. The paranoia became so severe that she genuinely convinced herself that her safety was compromised. Through her paranoia she even convinced me that everyone wanted to hurt her. This situation started my own paranoid behavior which is a manic behavior associated with having bipolar. Karen was seeing a counselor and had been seeing this counselor for a few years and was on anti depression medications. Karen convinced me that every one of her delusions was in fact legitimate. That feeding into her delusions is what changed my own bipolar for the worse. Delusions are manic behavior due to having bipolar. The unfortunate part of being bipolar hit me hard. I had no idea that I was Bipolar and now would forever be the rest of my life. My employer at the time (CDCR DJJ @ El Paso de Robles Youth Authority) started processing workmen’s compensation paperwork and started to send me to doctors’ appointments. By that time in late winter 2007 Karen with the guidance of her parents (Donald and Joan Mullis) went out of their way to twist and manipulate through pathological lies. This resulted in my rights to be completely trashed. Karen was perceived to be a helpless victim. She hid the paperwork from me and convinced everyone that I was dangerous. Karen’s manipulation succeeded and I’m still defending myself against her false allegations. Karen continues to through false allegations against me. Even though we haven’t been part of each others’ lives for nearly four years. Yet people still believe her. Karen in a professional and constant victim led by her own jealousy and insecurities. Karen and her lawyers adamantly uses the bipolar against me time and time again with the assistance of the entire Family Law process. This manipulation achieves her own justifications. The build up in our marriage was gradual. I now realize that throughout our 20-year relationship that I had been manipulated, psychologically abused, emotionally blackmailed and the occasional physical abuse. It’s extremely shameful to admit to this. Karen forced me through the years to give up all my friends and to abandon my own family. She would scream and insult me with the must heinous profanities until I conceded to her ever demand. Karen had the ability to clamp onto an idea and then justify it until she gets her way. If that didn’t work then an emotional blackmail ultimatum was used. Example: “Either you choose me or them…if you love me then you’ll choose me.” I choose Karen each and every time. I should have spoken up and not allowed myself to be emotionally blackmailed, continually ridiculed and browbeat. After being with someone for 20 years who leads their life by extremely jealousy, insecurity and justifications I just gave up defending my thoughts. I just agreed to everything for my own survival. The word ‘Hate’ was a consistent word used by Karen. I heard “I hate this, I hate that, I hate her, him and etc. I hate, I hate and I hate.” It was so emotionally exhausting being with and around someone (Karen) that is so full of hate and as a result to all their hate they always need to be built up. I sacrificed so much, and I lost my own independence and my own identity. Karen has taken our son away from me (his own father) and continues to brainwash Gregory (her own son). Then after a while I almost severed any and all other connections. Karen demanded my every second. In the fall of 2007 that wasn’t enough as Karen . . . she started to become jealous of the love and connection between Gregory and me. One example: She carried around a picture of comparison between how Gregory resembled her and her side of Gregory’s family compared to me and my side of Gregory’s family. Karen’s reasoning and ultimate actions were that when people mentioned Gregory’s likeness to me (which enraged Karen) . . . she would then present the photo comparison by approaching strangers with a photo line up of her and her family as an infant then a picture of Gregory. Then below those photos she put a photo of me and photos of my family as infants and then a picture of Gregory. Of course people would walk away bewildered and give her looks of bewilderment. Karen would yell at me because of these bewildered reactions; in her mind this was somehow my fault. Karen’s was hugely jealous and probably still is for reasons that I cannot conjecture. Somehow I had convinced Karen to get back together with her parents. I had been trying for years. When Gregory was born, I wanted her parents to be present but Karen refused to have her parents there and she wouldn’t allow my family present. She was convinced that everyone hated her (everyone). My becoming a yes dear your right browbeat kept man: I went along and supported her feelings of alienation and thereby alienated myself. I overcompensated and enabled out of fear. I am still afraid of Karen. Years of abuse inflicted upon me have resulted in my becoming overly-passive, my withdrawn and my shamed in being me. I feel ashamed in wanting to be in Gregory’s life. I’m a father without my son. Karen’s control over me has resulted in keeping me away from our son. Karen uses my Bipolar against me with the help, guidance and encouragement of her family. Karen to my knowledge has gone through 5-6 lawyers over the past four years. This has insured that Karen’s agenda being fallowed regardless: An agenda that I still cannot comprehend the reasoning: The unfounded jealousy is misguided anger is so damaging to Gregory. The ramifications are still unknown as Gregory has been subjected to countless lies and endangerment. This by Gregory’s own Family Law court appointed attorney Rae Jean Shore (An attorney that defiles California Bar Associations Codes of Ethics). Rae Jean Shore has ignored court orders, and presented false allegations even when allegations were proven false prior and done everything to cover her own tracks. Then there is this court-appointed counselor (Julie Stowasser) who Gregory is seeing. Karen Mullis and her family; specifically Don Mullis and Joan Mullis, have intervened and feed this counselor with their lies. Lies that Julie Stowasser has ignored and not even considered being lies. Therefor subjecting a child and directly brainwashing Gregory since he was almost two years old and he is 5.5 years old. Karen to my knowledge continues to have him see this Julie Stowasser after nearly 4 years. There have been so many accusations/allegations that have been proven false: Yet allowed to be presented and used against me in Family Law proceedings (Case No. FL 08-0295: California Superior Court, County of San Luis Obispo Div. Paso 1. These allegations were presented not only by Karen’s multiple lawyers but also by Rae Jean Shore. I have been defended myself for roughly four years now: Karen’s changing lawyers makes me wonder if they see through her lies and drop her as a client and/or does she fire them when she doesn’t receive reinforcement of her distortions of reality. For the past four years I have emailed, wrote and placed phone calls to countless family law attorneys, US and CA state Congressmen, Senators, and etc . . . anyone that could possibly help me yet not one did. I have tried to find support through Father’s /Men’s advocates. There are none that are local enough for assistance. There is a great deal of Mother’s/Women’s groups. I did receive assistance through a few Disability Organizations both Federal and State as they sent me information. I continue to try and I will continue to try. I love my son and he deserve to have me, his father, in his life as much as I deserve to have him, my son, in my life. It is my conclusion through my own experience and the countless stories I have heard from others that have Bipolar that there just is no form of representation. I have met an ex-surgeon that lost everything, bipolar hit him at age 65 years old. He now rents a room with 3 other people and delivers newspapers for a living. During the last hearing Karen’s latest attorney did not adhere to the pre-trial orders and continually filed court document after filing dates and I didn’t receive some of the court documents for the final hearing until after the hearing. That is only one example of the tricks I have encountered as I had presented several cases during the four years defending myself that were sent by Disability Rights Associations: Unfortunately those were all ignored. I am not a lawyer and defending myself has only resulted in my understanding that there is nothing that I could nor can do without having a lawyer to represent and/or defend me. A the Judge Burke stated during the last hearing, “What you going to do?” which is completely correct as what can I do as Karen has had lawyers which manipulate and continue to use the judicial system.. All I can do is defend myself with or without help…this is my third Christmas without Gregory. my son only want to be a father , his ex give file false allegations just because she can get apartment if abuse is shown and to keep him away from his son because he no longer want to be with her. the judge this week order that he can see his son on weekends and holidays but today she file a false police report to do her best to stop him from seeing his son and to get apartment how can this be stop?? it sad that woman who really need help are not getting it because women like her. who use the police and the court for the own selfish gain. and buy the way i have photo of her abusing him i hope the police see though her selfish plan.